The dentist or orthodontist initially conducts a thorough visual examination of the teeth, accompanied by a panorex x-ray and/or individual x-rays (at right). 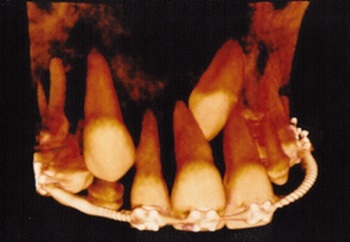 3D cone beam scans (as shown at the top of this page) are usually performed to delineate the exact position of the impacted teeth. Once the cause of the impaction has been determined, there will be several treatment options available depending upon the age of the patient. The objective is to aid the eruption of the impacted canines, and this can be skillfully done by an oral surgeon in conjunction with an orthodontist and the patients general dentist. If your mouth is overcrowded for any reason, the dentist or orthodontist may recommend extraction of teeth. 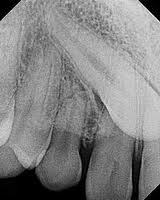 The extraction will generally be performed under local anesthetic by an oral surgeon. The un-erupted canine will then be exposed by lifting the gum, and guided into place using a special bracket. In the case of younger patients, an orthodontic brace may be fitted to create a space on the dental arch for the impacted canine. Surgery for impacted canines is a very predictable and successful office procedure. Pain medication will be prescribed as necessary, and you’ll be given post treatment advice for your recovery.